Remember the "Tribbles"? If you're a "Trekkie" you do. They're the little creatures that multiplied exponentially faster than rabbits. In no time flat Captain Kirk had so many of the little critters on the Starship Enterprise that he needed to give orders to numerous "Tribble trackers" to keep them contained. Reading staff notation on the guitar is a little like keeping track of Tribbles. Just when you thought you knew where the note "E" is, you find it on another string, then another. Guitar masters know there can be six or more ways to play any given pitch. For any given pitch, the guitar has not just one or two "alternate fingerings", but as many as six or more. Because of this, I've yet to meet anyone who can read guitar staff notation well unless they've put significant and regular time into learning it. Some guitarists assume that knowing how to read staff notation on piano or some other instrument will provide adequate preparation for reading it as a guitar player, but this is not generally true. It will certainly help, but it is far from automatic. Why is reading staff notation so much harder on a guitar than most other instruments? This is a difficult thing to explain, but perhaps an example may help: You are a piano player. You see a middle c written on the treble clef. You know that there is only one such key to depress. Now, imagine that there are six or more middle c's on the piano, each played by a different key. (They're probably not in the middle anymore!) In fact, imagine a piano that has at least two or three different keys to produce each one of the eighty-eight pitches possible on a piano! If you know anything about pipe organs, this might be comparable to having ranks and ranks of keyboards - as many as six or eight! This is comparable to what a guitar player must do whenever reading staff notation: for any given written pitch, a decision must be made almost instantaneously as to which of several places to fret it. Yikes - it's no wonder that few people master the organ - or reading staff notation on a guitar! Here's the really scary part: I have only described part of the problem. Yes, there is more to confound us noble guitar players! Guitar players also have to decide which of several techniques to use to produce any given pitch. Is it a plucked note, a natural harmonic, an artificial harmonic, produced with a slide, palm muted, tapped, etc? And what if alternate tunings are employed? Then the task can become virtually impossible, depending on the complexity of the tuning. Question: How do you stop a piano player from playing? Answer: You take away their music. Question: How do you stop a guitar player from playing? Answer: You put music in front of them. Get it? You might not. It's based on a generalization but it's often true. 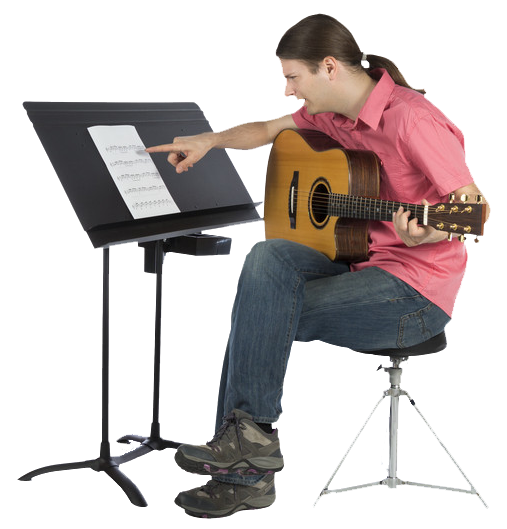 Piano players are often good at sight-reading, while guitar players are not so good. However, guitar players are often good at playing by ear, while piano players usually less so. Taking this generalization to the extreme, piano players don't play by ear and guitar players don't read staff notation. Thankfully, generalizations aren't always true. There are plenty of piano players who can play by ear, and plenty of guitar players who can read staff notation. How do we solve this problem of guitar players being less likely to be proficient at reading staff notation? Unfortunately, I don't think there's a simple solution. Tablature is everywhere and it is easy to learn. Staff notation is abstract and challenging to learn. The nature of the guitar makes learning to read staff notation even harder than normal. I don't think there's an easy way to solve this problem. Unfortunately it usually takes motivation, dedication, regular practice, and lots of time. So, when you run into a guitarist who can't read staff notation well (or at all), keep this in mind: Imagine yourself in Captain Kirk's shoes and try keeping track of an ever-multiplying batch of Tribbles!